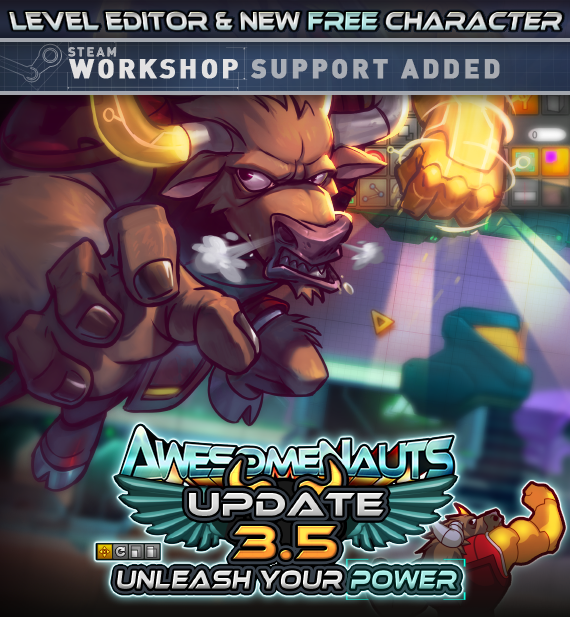 Awesomenauts 3.5: Unleash your Power – Out Now! 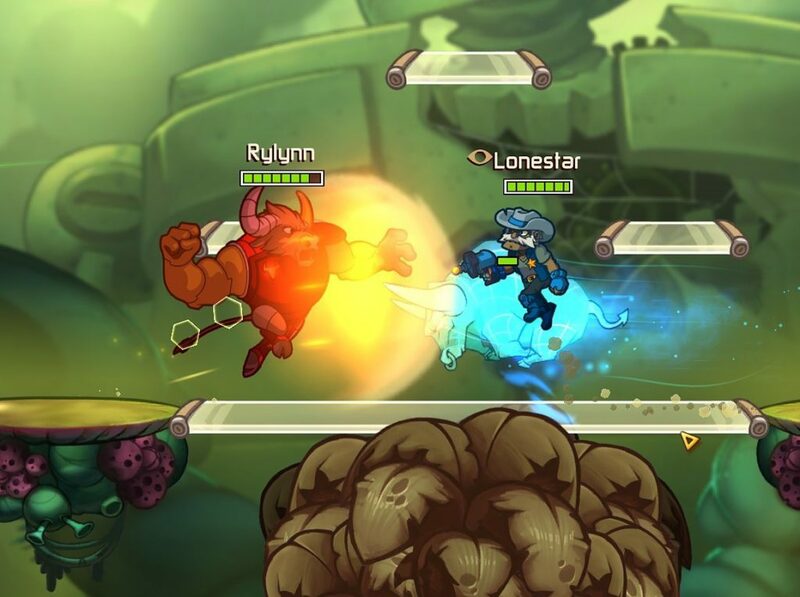 Awesomenauts 3.5: Unleash your Power just launched! The Level Editor, Steam Workshop features, and the new character Deadlift are available to everyone for FREE! This young Bovinion has spent his life in exile, training every day in the hopes of taking revenge on the cowboy that wrangled his entire race: Sheriff Lonestar! He’s a tanky support character that excels at absorbing damage dealt to both himself and his allies… but can also pack a pretty mean punch. He’s just not too great at dealing incredible amounts of damage in a short period of time. On encountering his archenemy, Lonestar, on the battlefield Deadlift has a couple of unique voicelines to taunt him! 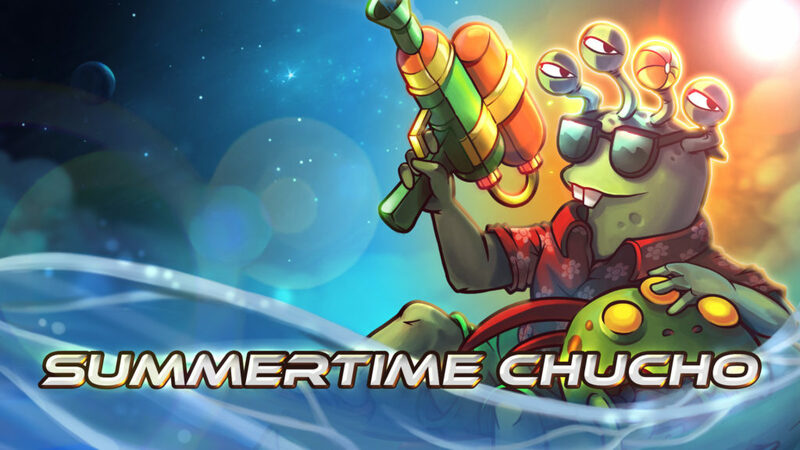 On top of all this, we’re also releasing a new skin for Chucho Krokk: Summertime Chucho! This summer-themed skin equips Chucho with two water pistols and replaces his sticky bomb with an equally-deadly beach ball! His trusty motorcycle has been traded in for an inflatable dolphin when he’s fighting on the red team, and an inflatable killer whale on the blue team. Ki-ki-ki-ki-kill! You’ll also be able to experiment with the Level Editor and try out creations uploaded to the Steam Workshop by other players. Just visit the Workshop page, subscribe to a couple of mods, and access them in the Custom Games screen in-game! It’s that easy!